(Nick Mediati @ PCWorld) New in Windows 10 is the Action Center, a unified place for all system notifications and quick access to various settings. It lives in a slide-out pane that appears at the press of an icon in the taskbar. It’s a nice addition to Windows, and it’s plenty customizable. Here’s a quick overview of your options. Would you rather not get an alert every. single. time. you get an email message? 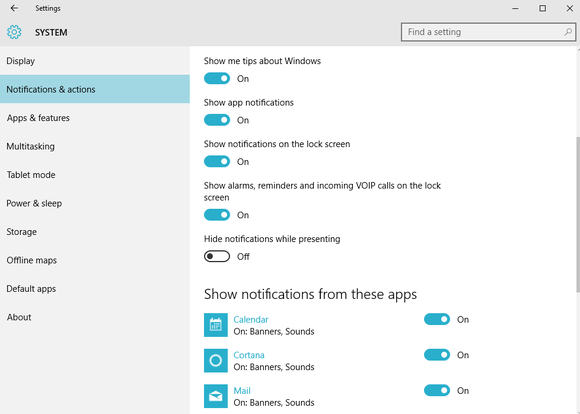 You’ll be happy to know that you can switch off notifications on a per-app basis. While atSettings > System > Notifications & actions, scroll down to the “Show notifications from these apps” subheading.